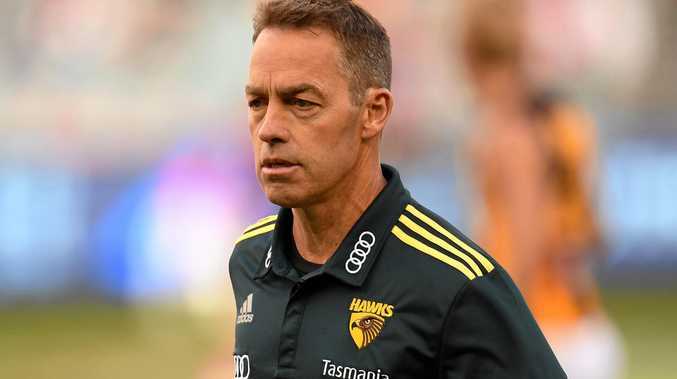 AFL: Coach Alastair Clarkson says the 3-6 record shared by his Hawks and Friday night's opponent Sydney means little in the two teams' intense rivalry. The Hawks are coming off an 18-point loss to Collingwood after leading by 43 points in the first half last week, while the Swans have won their last three after losing their first six games. Hawthorn could be within one win of the top eight if it gets a victory at the SCG, where it has won its past three games. Clarkson's men have beaten Sydney seven times out of their past 10 meetings but the Hawks mentor said that was all in the past. "It's a close season and who knows what's going to happen in the second half of the season," he said. "Both these sides are proud clubs (and) they've got a tremendous rivalry, having played each other in big games in finals over the last five or six years. "So irrespective of ladder position, they're always keenly contested affairs." Clarkson said he did not expect to make any changes to his midfield rotation, after being critical of the support around 50-disposal ex-Swan Tom Mitchell last week. "We try to make sure we're pretty flexible through that part of the ground, but we need to be because Sydney's got a deep midfield themselves," he said. "We need to have good energy through that part of the ground, because that's where the game will be won or lost on Friday night." Hawthorn is set to regain young key-position players Tim O'Brien (hip soreness) and Kaiden Brand (illness) after they were late withdrawals against the Magpies. Clarkson said Jaeger O'Meara was progressing well from his latest knee setback, but ruled out playing the former Gold Coast midfielder before the club's round 13 bye in mid-June.